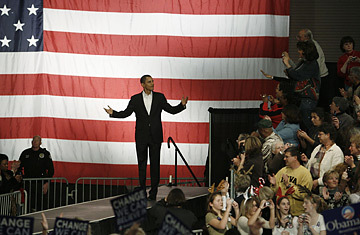 Democratic presidential candidate Sen. Barack Obama (D-IL) addresses a campaign rally in Des Moines, Iowa, December 8, 2007. At just 25 years old, Michael Blake may have more to do with Barack Obama's chances of becoming President than anyone besides the candidate himself. That may sound like a stretch, but Blake has the all-important job of bringing in new Iowa voters to caucus for the Illinois Senator. And while some campaigns may focus most of their efforts on one or two constituencies  the way John Kerry so successfully courted military veterans in 2004  Obama is spending an unprecedented amount of money and effort to turn out a wide cross section of new caucus-goers. "This is the most extensive effort to reach out to new constituencies in the Iowa caucuses, I think, ever," says Blake, who comes from the Bronx and was in the first class of "Yes, We Can!" a program Obama started soon after he was elected to the Senate to train minorities to more effectively use the political system. "Campaigns here have traditionally gotten attention for going after one or two groups. We're applying that principle and hopefully will enjoy similar success with multiple groups." Over the last eight months, Blake, with the help of his staff of about 25, has been developing what he calls peer-to-peer contacts. Veterans call veterans, high school students call high school students and so forth. Seven staffers reach out to black voters, for example, and three handle Latino voters  even though Latinos make up only 3% of Iowa's population of three million and there are only 67,000 blacks in the whole state, according to the 2006 census. "[This] is exactly why it's a problem for the Clinton campaign to bring in 100 new staffers in the last month," said Tommy Vietor, Obama's spokesman in Iowa. "We've been working and developing personal relationships and a network of Iowans for months." While the results have yet to be proven, most observers agree Obama has made the biggest bet on reaching out to different groups of voters. "I do think he's got a more legitimate claim to bringing in new people: younger voters, college voters, bringing in a new audiences," said Iowa State Senate majority leader Michael Gronstal, a Democrat who isn't endorsing a candidate this cycle. "If he brings in enough, that's the advantage; if not, then Senator Clinton's old line of establishment Democrats becomes telling." In past election years, many candidates that bet the farm on getting new faces to sacrifice an hour and a half of their time to argue politics with their neighbors have more often seen their campaign hopes stay home. While Jimmy Carter and Gary Hart both brought in significant numbers of new faces, many more candidates, such as Howard Dean, have failed in spectacular fashion. The former Vermont governor bet that more college and high school students, inspired by his insurgent candidacy, would turn out to caucus for him. Instead, he ended up coming in third in 2004 behind Kerry and former North Carolina Senator John Edwards. And while Obama could certainly suffer as surprising a defeat as Dean, his supporters believe his operation is very different. Tom Harrington supported Howard Dean in 2004. This go-around he is Obama's co-chairman for Story County. "What's the difference? Organization!" said Harrington with a laugh at an Ames house party last month for a dozen undecided friends and neighbors. Harrington spent nearly two hours cajoling the group over wine and cheese to support Obama. "Dean never asked me to do anything but show up and caucus. This is my fourth one of these for Obama," Harrington said with a wave of his hand around the cozy living room. "And I've got another two this weekend." To a certain degree Obama's own ethnic background helps him: he can speak convincingly to black voters, and his half sister Maya Soetoro-Ng, who is half white and half Indonesian, has campaigned for him amongst Asian Americans. His rock star status has helped recruit high school and college kids, though it's anyone's guess if they will actually turn out. Harrington's daughter, Caitlin, a freshman at the University of Iowa, organized 47 of her classmates to caucus at home  signing them up through "Rock the Caucus" on Facebook  and is working to find them all home precincts to go to during vacation. Though all of Harrington's classmates are Iowans, Obama's campaign has gotten into some trouble in their zeal to rally the college vote: campaign workers passed out some 50,000 fliers encouraging students from out of state to return to campus early to participate in the caucuses. While strictly legal  since they are technically residents of Iowa  it goes against the spirit of the caucuses, and Obama has been roundly criticized in Iowa papers for the move. While Obama pursues his comprehensive caucus strategy, his chief rivals, who benefit from the vast majority of union endorsements, have taken a more targeted approach. Edwards, the only Democrat who has been to all 99 of Iowa's counties, is focusing on turning out rural caucus-goers, said Dan Leistikow, Edwards' Iowa spokesman. Clinton is focusing her efforts on women, a natural constituency for the former First Lady that is ripe for the picking. In 2004, just 66,690 of 340,241 female registered Democrats in Iowa caucused, or just 20%, compared to the 281,049, or 83%, who voted in the general election. As evidenced by his highly publicized campaign swing with Oprah Winfrey last weekend, Obama isn't exactly ceding the female vote to Clinton. In fact a recent Des Moines Register poll showed Obama overtaking Clinton among women voters for the first time in the race  31% to Clinton's 26%. Obama is also doing his best to appeal across party lines. He has been reaching out to Republican and independent voters who can change their registration at caucus sites by simply signing a letter of intent. Said Miller: "He is probably the only candidate that could really do that [bridge the party gap]. It's important to him, he knows it's central to what he wants to accomplish." The hostess of the Ames house party, Andi Smith, was a former independent who twice voted for President Bush. She switched her registration to support Obama and claims a lot of independents and Republicans will be doing the same on caucus day. Even voters who have seemingly made up their minds to support other Democrats are seen as fair game. Attending the same house party in Ames were two voters who were already committed to other candidates  New Mexico Governor Bill Richardson and Senator Joe Biden. They were shopping for a second choice, in case their choices don't reach the 15% vote threshold (when any Democratic candidate fails to get 15%, their supporters then go to whomever is second on their lists). "The Obama campaign is very aggressive in asking folks if we're not people's first choice," said Gordon Fischer, a former Iowa Democratic Party state chairman who endorsed Obama two months ago. "The campaign follows up and asks if we can be their second choice."